Recently I received an email from one of the readers and he addressed me as a Non-American blogging on America. Well, it reminded me to write on India too! So here is one post on India- a destination from my own Karnataka. 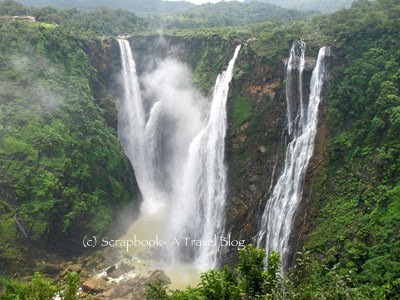 Jog Falls (830ft), one of the tallest plunge waterfall in India is located in the state of Karnataka. This is one of the major tourist attractions that comes to life during the monsoons. River Sharavathi plunges down 830ft in four segments to create this magnificent beauty. I have been to this place more than 15 times and have trekked down to the base several times. This year too I went soon after the news that the river is swollen and the Linganamakki Dam gates are open. I wanted to see that enormous flow of water like it happened in August 2006. But, no luck. I happened to see the same old look of it. To add to that there was thick fog and once a while it would clear for few seconds or so. Still a beauty! huh? Each segment of the falls has a name. Raja, on the far left taking the direct plunge. Roarer, the short waterfalls beside Raja which makes the roaring sound. Rocket, a series of shooting jets. And finally the gracious Rani on the right. How to reach: Nearest town is Sagar which is 30KM away. There are tour buses going from Hubli (165KM) and Bangalore (350KM) as well, on weekends during monsoons. Going by car is the best choice for a day long excursion. If you are driving then first check the road conditions during monsoons. Street-side stalls sell water, soft drinks, snacks and fruits. The pineapples here are very sweet, when the slices are sprinkled with salt-pepper/paprika taste heavenly to the tired souls. Try it, it is fresh and tastes great. Leave a comment to share your beautiful thoughts. If you have enjoyed this article then connect with Google+, Twitter, Facebook or subscribe through email for more exciting updates! Bhatiaji, Visit only during monsoons! Lovely post on Jog. Has never been here before. Must be a splendid time to visit now after such abundant rainfall. It's a lovely waterfall. But doesn't have much water these days other than the monsoons. Nice pictures. Yes, you are right. Thanks! Wow!That's a very beautiful waterfall. i love fog most of all, so these shots are speaking to my heart. Glad the pics touched your heart May! This is awesome, Kusum!! I've never seen such incredible waterfalls and the fog is is so beautiful! Terrific captures! Thanks for sharing the beauty! Spectacular indeed! The fog adds to the mystery of the falls! Such a nice place to visit. What a gorgeous area and beautiful waterfalls.. The waterfalls and fogs are beautiful. It does look nice with a lot of water. Wonderful post and photos. The pictures are too good. Thanks Indrani. Visit the place only during monsoons! What a great looking place - I need to try harder to get work to send me to India. I found the opening sentence of this post strange - is it a problem that you are blogging about America! PS: the literary reference is to "The World According to Garp"
Wow, that is a spectacular waterfall. The photo through the mist is exquisite. I love to visit waterfalls, but sadly I don't think I'll ever be able to add this spectacular one to my "collection", so thank you for sharing it. By the way, I don't think of you as a "non-American blogging on America", but instead I think of you as a world traveler and world-class blogger! It looks like a wonderful place to visit. I love waterfalls for the wonderful spray of water they give when you get close. Thank you Joyful! Yes, the spray definitely feels divine! Such a beautiful waterfalls. Am yet to see it in its full glory. Jog Falls is one of the Adventure tourist places in Karnataka,The sight of this magnificent sheet of water cascading straight down a height of 830 feet unfettered by rocks or other encumbrances is one that has moved thousands of visitors.